Many conservatives love to talk about getting rid of the income tax, yet it never happens. Even when Republicans had full control of government, there was no serious effort to abolish the IRS, implement a national sales tax, or even create a simple flat tax. I, while not exactly a conservative, have joined this disappointing political chorus by writing an extensive chapter on how to reform the income tax instead of demanding an immediate replacement. The income tax, alas, has many upsides. Coming up with a good set of replacement taxes is harder than it looks. 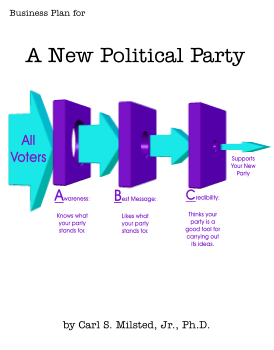 Actually implementing the shift would be harder yet, both politically and logistically. In the long term the effort would be worth it! The income tax – even if reformed – has many inherent downsides. Even from a purely left-liberal point of view, an income tax is not the optimal tax! Conservatives and libertarians would do well to reform the existing income tax, even if abolishing it is the ultimate aim. Ye will not make the switch overnight. Liberals should seriously consider income tax alternatives. Income taxes are less progressive than advertised. I will alternate between plusses and minuses of having an income tax in the sections to follow. 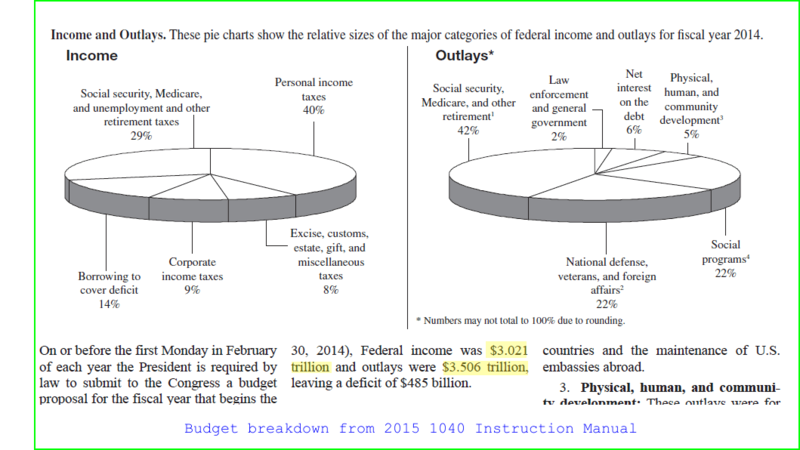 Income taxes brought in 40% + 9% + 29% = 78% of the total budget of $3.5 trillion. (I’m counting payroll taxes as income taxes, since if you work for a living, your pay is your income.) 78% of $3.5 trillion is $2.7 trillion. Replacing that much federal revenue isn’t easy. And given 2014 spending levels, the federal government needed half a trillion dollars more to have a cash balanced budget. My liberty-minded friends consider the revenue-slurping power of income taxes to be a defect; it makes big government too easy. I would agree – if I had a time machine to prevent an income tax from being enacted in the first place. But I don’t, and the money has already been spent! The national debt is over $19 trillion and the Baby Boomers are starting to retire. Even with a half trillion cut in annual spending, the government needs more revenue, not less, in order to pay down some of this monstrous debt. Have a look at the pie charts above. Nearly half the budget is taken up by retirement obligations and interest on the debt. Law enforcement is less than 2% of the federal government, so even if we end the Drug War, that only buys us a percent or so. (Maybe more, if we get a lot of tax revenue from cannabis…) National defense includes veterans’ benefits – promises already made. And even if we stop meddling in the Middle East, we might want to maintain a mighty military; our government has made quite a few enemies over the years, and we have a lot of loot to guard. The income tax has been around for a century now. That’s a century’s worth of special interest backroom deals, ugly compromises, and nit-picking categorizations. The combination of federal tax law and regulations has grown to over 10 million words! Ignorance of the Law has become a reasonable excuse. Mastery of the Law has become the new aristocracy. Congress does not have time to review the over 2 million words of tax code to give it a proper cleanup. There is much to be said for scrapping the code in its entirety and starting from scratch. The tax code is like an old piece of bloated software, written by contractors paid by the line of code. But we need to be careful! Old software is often bloated because it contains accumulated wisdom! Some of the junk buried within the tax code is useful: definitions, clarifications, edge cases, etc. Our income tax system is largely “voluntary.” Most people report their incomes to the government without a federal agent looking directly over their shoulder. Mind you, I don’t mean voluntary in the true sense of the word! It’s “voluntary” in that you don’t need a full blown secret police system to collect it. Under an income tax, people rat out each other. My income is my employer’s deductible expense. My home mortgage deduction is my bank’s income. My AdSense earnings are Google’s expense. And so forth. In feudal Japan, an entire village could be punished for the actions of one malcontent. The peasants preemptively turned in or thwarted potential revolutionaries. This authoritarian system worked for centuries. No secret police necessary. The income tax likewise works. This would not be the case for a national sales tax! Neither buyer nor seller have any incentive to report the transaction to the IRS (or its replacement) other than fear of being caught red-handed. Enforcing the Fair Tax would require a large network of spies and informants. We’d need surprise inspections. And given the tone of the times, some of those inspections would be SWAT raids in the middle of the night. Oh, and the War on Cash would reach a new level. Do all monetary transactions electronically and give the government a back door to the security, and the Fair Tax would work. Just what is income? Opinions differ. That’s why we have stock markets. If accounting was an objective science there would be no difference between market and book value. Accounting is a huge set of conventions for estimating income. For public corporations, or any business that can be sold, adherence to common conventions is very useful. Yes, there will be errors in estimating income, but they will be consistent errors. Relative valuation sort of works. But for a small personal business, such conventions are overkill! I once had a business selling political T-shirts. Figuring out how much I had made could have been a simple matter of keeping track of the sales price and what I paid for my stock. All I needed to do was count the remaining shirts in my closet to know what I made. But frankly, I didn’t need to know precisely what I made. This was a small side business. Keeping track of money lost due to discounts, etc. was not worth my time. But I had a corporate partner – the IRS. And so I hired an accountant to set up an accounting system on QuickBooks. And I easily spent as much effort figuring out QuickBooks as I did doing the actual business. For a large mature corporation, all these controls are useful, and a company like Wal Mart can afford to divide the overhead efforts of top specialists to set up an ideal accounting system that meets recognized standards. This gives Big Business an extra advantage over sole proprietorships! Hippie liberals take note. Once upon a time, Americans cared enough to amend the Constitution before declaring it changed. When they wanted bigger government funded with something other than tariffs and excises, they passed the 16th Amendment. Income taxes are constitutional. Some of the alternatives are also constitutional. A carbon tax is just a set of tariffs and excises. A national sales tax could probably pass muster as an excise tax. But I have some tax ideas that might not pass constitutional muster. For example, does the federal government have the authority to tax property? The question may well be moot. Today we have lawyers and judges smart enough to reason around just about any provision in the Constitution. They can even add a virtual amendment to the Constitution a couple of decades after the real amendment failed. Liberals in the audience take note: if you believe in the Bill of Rights, if you believe in innocent until proven guilty and the right to remain silent, you should have qualms about the income tax. The individual income tax built on forced confessions. Report your income or pay a steep penalty. And this includes income from criminal activities. Under the income tax you can be prosecuted for not turning yourself in – a complete inversion of the 5th Amendment. Just ask Al Capone’s ghost. Income is a pretty good proxy for ability to pay. And it’s reasonable to believe that people with high incomes are richer than the rest of us. So if we have progressive tax rates – without too many loopholes – then the income tax could be a tool to narrow the gap between rich and regular. A sales tax is worse than a flat tax in this regard. The poor and middle class have a lower savings rate than those with more income than they “need.” A prebate makes things progressive on the bottom end, but that still leaves Warren Buffet and George Soros way, way, way, undertaxed. Income and wealth are not the same things! The family doctor who works for a couple hundred thousand a year is far less rich than a trust fund baby who receives half the amount for doing nothing useful. Progressive income taxes clobber you as you are getting rich. Once there you are set. If the income from your fortune puts you in too high a bracket, you can simply buy tax free municipal bonds. A steeply progressive income tax creates a caste system. Look at popular culture from the 50s and 60s, the time of high income tax rates. There were plenty of millionaires in the movies, and plenty of servants in evidence. Meanwhile, the Beatles – liberal icons – railed against the Tax Man. The head of the Hollywood Actor’s Guild went from New Deal Democrat to conservative icon. His name was Ronald Reagan. He came to loathe progressive taxes for a simple reason: celebrities such as many movie stars and most athletes make most of their income over a short stretch of career. This puts them in high tax brackets even if their lifetime income is less spectacular. Getting rid of the income tax system would be hard, but worth the effort if replaced with something that is more fair and friendlier to liberty. Given the difficulties, whatever taxes we use to replace the income taxes must overlap. Yes, this gives the government some dangerously powerful taxing power, but with 19 trillion dollars of debt to pay off, this could be a good thing.